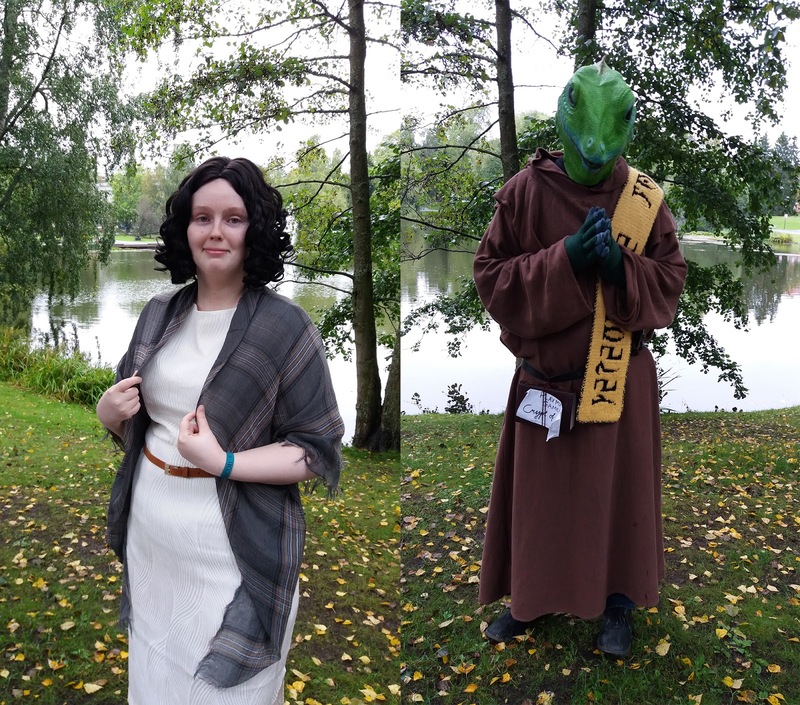 I visited Tracon last weekend with my fiancee Tecsiederp (read her post about Tracon here). I had a lot of fun there, cosplayed a bit and bought some stuff. I'll divide every day in their separate things. We arrived to Tampere rather early on and first we visited a pizza place called Napoli, since we were really hungy after the train trip. I think that was the best pizza I've ever had in my life: It had pulled pork, bbq and salami as toppings, and oh man oh man it was so good. After that we checked out a local game store called Puolenkuun Pelit. I used to buy all my games from there when I was younger, so it was nostalgic in a sense. There were loads of games both new and used, t-shirts, tabletop games and RPG's, but I ended up getting nothing because I wanted to save money for Tracon and I didn't really find anything interesting. We also visited a cat cafe. I have to admit I wasn't a very big fan because of my allergies, but atleast Tecsie was happy, so it was worth it. I learned that my allergies have "toned down" over time, because even there was like atleast 6 cats, I could breathe just fine at first. When I was younger it was way more severe. Later that day we went to see Gamedev panels at Tracon. I was so happy to be there, even for some reason I felt really lightheaded and ill. We managed to hear the two last panels, that were about game art design and gameplay design. I didn't really care much for the art stuff, but it was nice to hear how it all works behind the scenes. The game design panel was much more interesting to me, there was a lot of good ideas, tricks and tips thrown around and I even got to talk with one of the game designers! I was such a nervous wreck because I have so much respect to people working in gamedev and I'm just socially awkward. I did manage to ask few questions about my game ideas, such as "Am I digging a grave for myself because I try to make a game like Morrowind alone?" The answer was, unsurprisingly, "Yes." and he reminded me to keep the scope small at first. "Make a 'Morrowind' game about a small village first." It motivated me to start designing a smaller RPG prototype I could build on more and more stuff eventually. I was really glad I went there, I learned a lot really. We spent the whole Saturday just walking around the con area. It was raining outside so almost everyone was inside the entire time, so the place was fully packed. I saw a lot impressive cosplays, but I was a bit afraid to ask for photos and I didn't want to bother anyone. Tecsiederp was Claire from Outlander. I was an Argonian Wizard Nerevarine. However, the weirdest thing was, couple guys asked photos of me! It was so unexpected, but I let them take photos. The first guy talked with me about Morrowind a lot, because he noticed my scarf that Tecsie had made for me. The daedric lettering on the scarf translates to "Nerevarine Hortator Outlander." I enjoyed my cosplay, but it was so goddamn hot inside that robe (that was loaned to me by my friend, thanks again!) I had to go to the bathroom and rethink my clothing, lol. The rubber mask I had wasn't very comfortable nor good either, because I couldn't see a damn thing inside of it, so I had to keep it off most of the time. 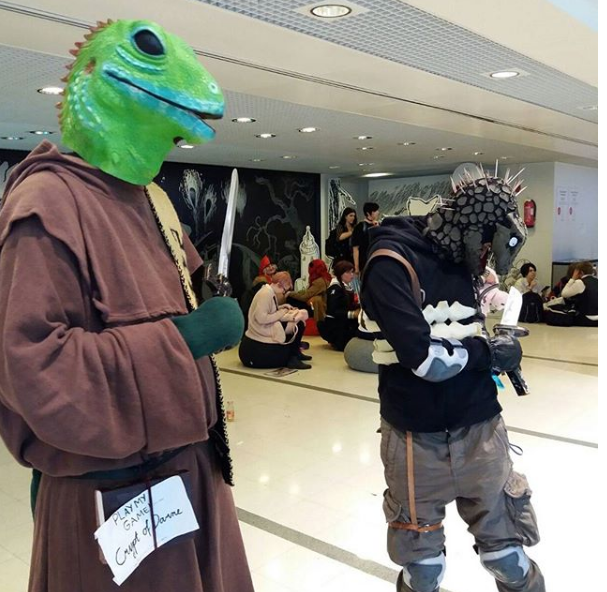 I met also this one person who was cosplaying Kaiman from manga called Dorohedoro. It was kind of funny how they spotted me first and was like "Hey fellow lizard!" We then talked about our cosplay and when I realised that they were cosplaying Kaiman they got really surprised. Apparently I had been one of the few who had guessed correctly, and they told me that not many know about Dorohedoro. They were genuinely so happy, it felt really nice to talk to them. Last but not least, we visited Finnish Game Museum. It was full of games I knew and had played and some older titles too. Most, if not all of the games there were made by Finnish people so it was interesting to see the very old games other Finns had made. I finally got to play "Uuno Turhapuro muutaa maalle!" and it was pretty fun! I would've loved to spend more time there but we were in a bit of a hurry to leave, since Tecsie's dad took us to a nice Chinese restaurant. Last day we visited the con briefly before our train left, but there wasn't much to see really. Tecsie just wanted to spend her last art money on art stuff, lol. My legs were so sore after the whole Saturday walking around, I didn't even mind the long trip home. It was nice to just sit down and relax, but there was some random kid running around, screaming and kicking seats and the kids parents didn't seem to care. I could tolerate it but it wasn't fun. On top of that, our train was nicely late! We almost missed our bus, but luckily our legs had enough energy to run to the bus stop. 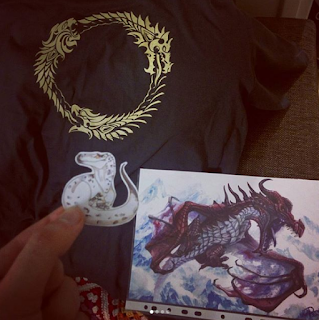 Stuff I bought from Tracon: ESO shirt, a raptor sticker and Odahviing print. I didn't buy much because that shirt was expensive, but worth it! It was a very taxing but super fun weekend! I hope to visit Tracon (or any other con) next time too, I just have to get a better, more comfortable cosplay for next trip. 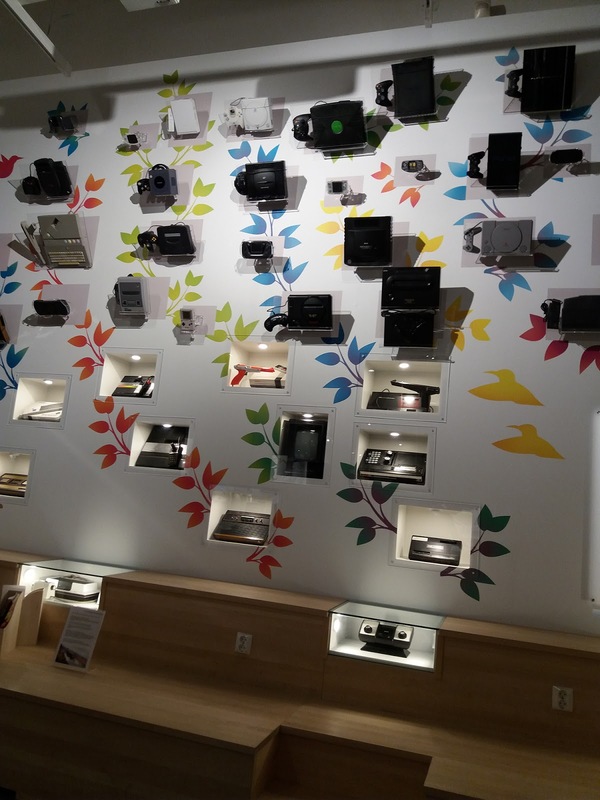 Would be neat to visit some gamedev con in Finland, if there are any.